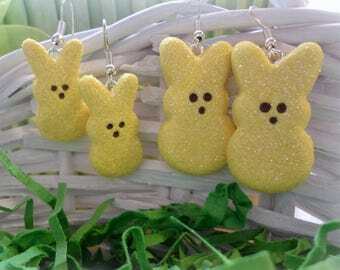 These adorable, one-of-a-kind, handmade creations are guaranteed to get people talking! I offer a variety of styles. If you have an idea, don't be shy, I welcome custom orders! Any design is possible. 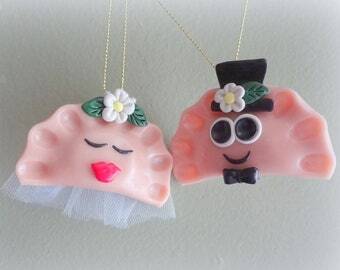 So, contact me with your request and I will create your very own one-of-a-kind ornament to celebrate with! 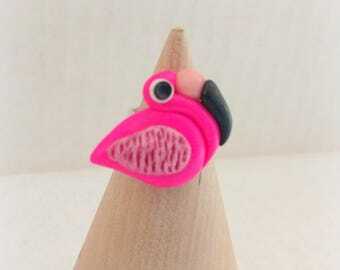 I make a variety of fun styles of earrings, rings and charms. I take my time with each doll and add as much detail as I can. 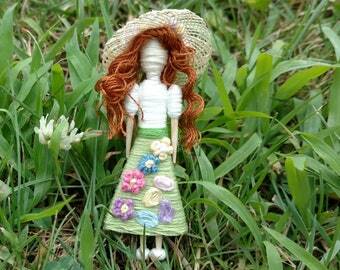 Each and every one of my dolls are created by using only embroidery thread, toothpicks and some glue. 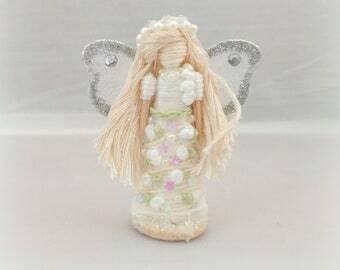 I sometimes add tiny accents of rhinestones, pearls and accessories like organza for veils, wings for fairies or perhaps a small hat, but the main doll, the frame, hair, clothes, are solely made by me wrapping each strand of thread by hand. No sewing or fabric used, only thread. I have used this technique for over 20 years. There is alot of time and patience put into each of my dolls and it has been challenging at times, but a challenge for me equals fun! You can also send me a picture of someone and I will make a doll in their image. Just send me an email with all your design wishes and I will work on it with you to create your own personalized, one-of-a-kind, custom made toothpick doll! If you are looking for a more elegant style of jewelry and/or accessories, then be sure to check out my array of handcrafted beaded earrings, bracelets, rings and more. 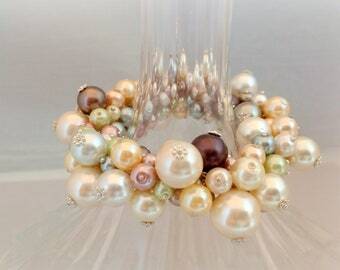 I use a variety of pearls and crystals to create a more elegant style. Most of my jewelry items are created using vintage components, adding a little history to the pieces and making them one-of-a-kind. If you have a custom request, contact me and we can work together to come up with a beautiful handmade design just for you! *I would be happy to recreate just about any of my Handmade items you see in my Sold Orders, my About Page, on Pinterest and Facebook. Just ask me! 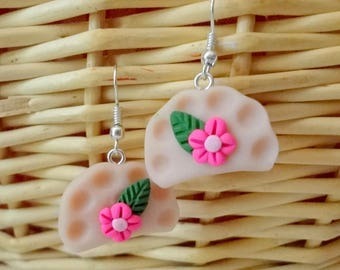 All handmade items in my shop were made by me...Jenna. So if you have any questions, special requests or even just want to chit-chat, feel free to contact me! All CUSTOM Handmade items are made when they are purchased. So you will always receive an item made just for you! 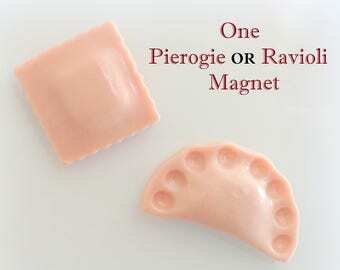 Pierogie Pal® mark is registered with the United States Patent and Trademark Office. All rights reserved. being from Pittsburgh originally...I just love these!! 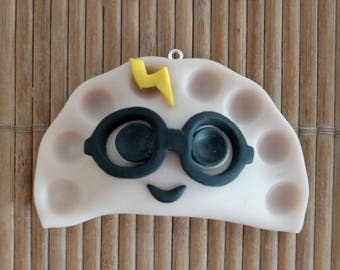 the cutest pair of earrings EVER!! Arts and crafts have always been a passion of mine! Hi my name is Jenna. I love arts and crafts, either making it myself or appreciating what others create. 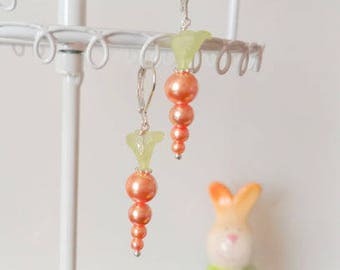 Every Handmade item in my shop was handcrafted by me. I love to come up with unique ideas and of course seeing those ideas through. I take my time, so that I can be proud of my creations and feel good about offering them to others. When I was little, my parents were always very supportive of my arts and crafts. They always encouraged me to "think outside the box". I looked forward to Christmas every year (what kid doesn't) because I always got a set of new arts and craft supplies to experiment with. For months following, there were paper scraps, paint palettes, markers, colored pencils, string and whatever else all stuck together with glue, just laying around the house! Bless my parents for having the patience! Now my husband gets to experience that patience, because I still have paper scraps, paint palettes, markers, colored pencils, string and whatever else all stuck together with glue, just laying around the house! I guess there are some things you never grow out of. My craft projects we're starting to reach the ceiling and before we had an avalanche in the living room, I figured I should do something about it. So, I opened my shop here on Etsy in 2011. It has been a wonderful experience for me! I get to meet new and interesting people, I get to be a part of a "family-like" community and I get to share my crafts with others. So, that's me. I want to thank you for allowing me to tell you a little bit about myself and thank you for taking the time to read this. You can stop by my Etsy shop and visit me anytime, even if you just want to chit-chat! I look forward to hearing from you! Well, off to the craft room to see what my next project will be! Come follow me on Facebook & Pinterest! Welcome to Array Of Happiness! I want you to have a pleasant shopping experience here at Array of Happiness, so if you feel in any way that you did not receive the quality service that you deserve, please contact me with your concern. Your HAPPINESS is my goal! 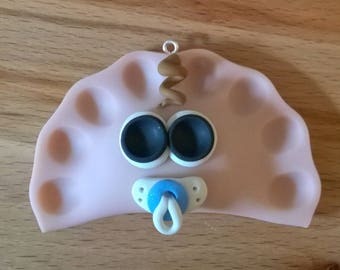 *My handmade items are all made by me...Jenna. *I make each of my handmade items myself, so no two pieces will be the same. Please understand that if you order multiples of the same item, there will be slight variations between them, but I do try to make them as close as possible. I take my time creating items just for you, however please understand, mistakes can be made. If, upon delivery, your item is damaged, please include a picture of the packaging as well as a picture of the damaged item in an email, so that I may see the damage and decide how to proceed with the loss. **I do NOT accept returns or give refunds on custom orders. These custom items were made just for you. If there is a problem, please contact me within 24hrs of delivery so we can discuss your options. I will work with you as best I can to resolve any problems. **Payment is due at the time of your order, and must be received before I will ship out an item. **For larger custom orders, I request a partial, non-refundable payment upfront before I begin your order. This is to help cover the materials for your order. I offer discounts for large orders. Just contact me for details! I know the anticipation of waiting for an order to arrive, so I make sure I get it to you as fast as I can! *Orders are typically shipped within 3 business days. *weekend and holiday orders go out the following business day. *Shipping cost keep going up and I understand it can be costly, so I will combine shipping on multiple listings. If you are interested in multiple listings, contact me for a combined shipping quote. ***PLEASE MAKE SURE YOUR ADDRESS IS CORRECT ON YOUR ACCOUNT. This is the address that I ship to. If you would like your order sent to a temporary address (ex. gift, moving, etc. 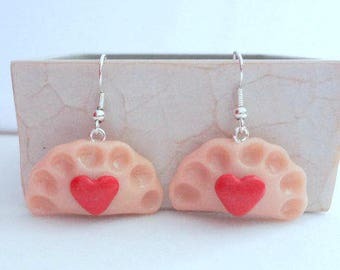 ), please send me a message so that I can make sure I ship to the correct address, otherwise, your order will go to the address that you provided on your Etsy account. I love to do custom orders! If you have a special request, please feel free to contact me with any questions. *Custom orders can take 1-7 days to complete, depending on the quantity and difficulty of the request. *I will show you pictures of the completed item and if you want any changes made, I will be happy to fix them for you before shipping. Once you approved it, it will be in the mail and on it's way to you! I have you approve your custom order before shipping because once your order is shipped, I do not offer any returns or refunds on it. This item was made just for you. If there is a problem, please contact me so we can discuss any options. I will reserve any listing for you, as long as you intend to purchase it. Please contact me and let me know which item you would like me to reserve and I will create a special reserved listing just for you. I will reserve any listing for up to 14 days. You may purchase any during that time.